As our followers know, we like to keep you all caught up on the latest social media updates as soon as they’re happening around the globe. VERO, the new(ish) social platform being pinned as the “new Instagram” by social media gurus everywhere, has taken the App Store by storm this past week. Of course, we’re all curious about this new “social media gamechanger”, so we’ve thrown together a Q + A post to answer all of your lingering VERO questions. So, what is VERO anyway? 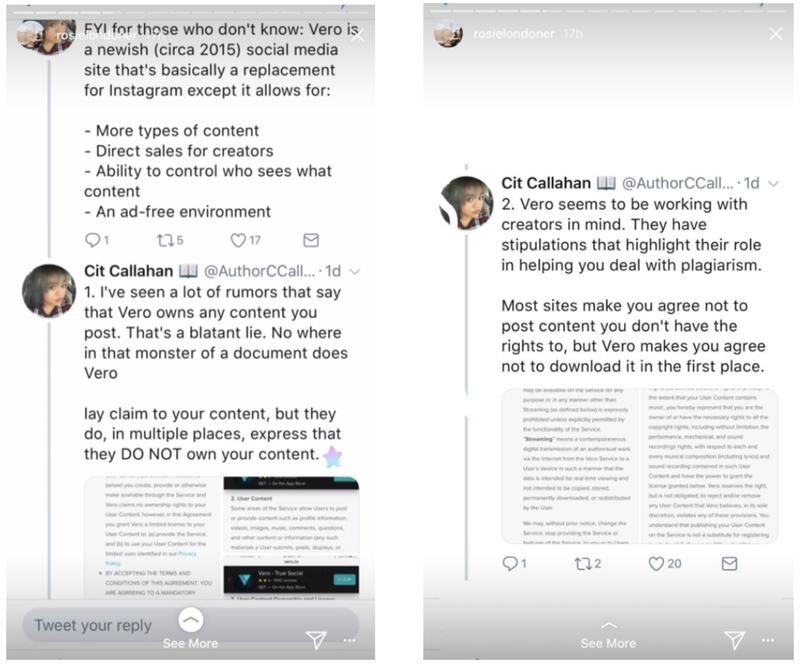 VERO’s platform claps back at Instagram’s complicated new algorithm with an ad-free feed in reverse chronological order. VERO’s layout continues to compete with Instagram, moving beyond just photo and video content. An article on BBC explains founder Ayman Hariri created VERO to combat Instagram’s algorithm overflowing with advertisements and a feed organized by levels of engagement. VERO’s culture revolves around the concept of “true social”, where users have the opportunity to “be themselves”, which Hariri believes to be difficult via Instagram and its algorithm. Wait a minute. For real? Yep, you read that correctly! Ad-free feed AND your posts are in order! Plus, VERO started out with a promotion of a “free for life” subscription for its first 1 million users. In response to the massive surge of downloaders, VERO stated on their website that they will be implementing free subscriptions for all users until further notice. Right. At the start of its peak in the Apple Store a couple weeks ago, VERO has been crashing ever since. The majority of new users get as far as creating a profile with a photo and a short bio, but are unable to post anything to their feed. Now, I’d be remiss not to mention that VERO’s CEO is Saudi Arabian billionaire entrepreneur Ayman Hariri may not totally credible. There’s some bad PR surrounding past businesses. We’ll let you decide on that front and aren't going to dive too deep here. Ok, now I can’t decide. Should I download VERO? What’s the bottom line? We’re on James Nord, the co-founder of Fohr Card’s side when he discussed VERO in his latest Drink with James episode. While we agree that influencers and businesses should be open to exploring all of the latest social media platforms, VERO most likely won’t make it into the ranks with Instagram and Facebook. For an app to come in and disrupt Instagram and Facebook, it’s going to take something totally different. Snapchat really is the closest app that’s gotten close to doing this. So in my opinion, VERO is way too close to Instagram to truly disrupt. And in a sense, I feel like it’s almost already dead. BOTTOM LINE IMO - Download it, claim your profile and play around with it, but don’t invest too much or go all in, VERO most likely isn’t going to stick. Let us know your thoughts on VERO - have you downloaded? Will you be staying loyal to Instagram?